That fantastic first trailer for Iron Man 3 was more than a tease for the first film kicking of Phase Two of Marvel's cinematic universe. But there are a few things that we didn't catch much of a glimpse of in that trailer. The first is co-star Rebecca Hall, who is playing "a scientist who plays a pivotal role in the creation of a nanotechnology." In a new first look photo, she's in some sort of unseen danger and has been a little roughed up. In addition, we have a new shot of Ben Kingsley as the villain Mandarin, a closer look at Iron Patriot armor, and a worrisome shot of the broken helmet of Iron Man himself. Can it be May 2013 now? This is up there in the top 3 of superhero films I most siked about, along with Guardians of the Galaxy and Days of Future Past I think, Bring it on! What is the fuss with the new images...they are all visible in the trailer...did they just release 4 screenshots from the trailer they released a month ago(or however long ago it was)! There no fuss. 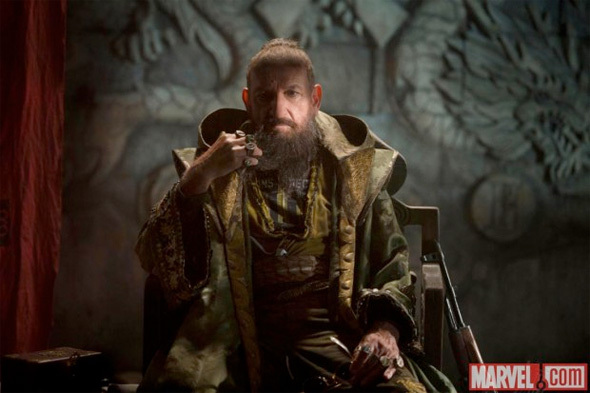 It's a slow news day, and rather than having to freeze frame the trailer, we figured it couldn't hurt to toss these images up so people can look at them more closely, especially the new shot of Mandarin. I was under the impression that this was not actually the Iron Patriot, but the War Machine armor painted in a similar scheme. 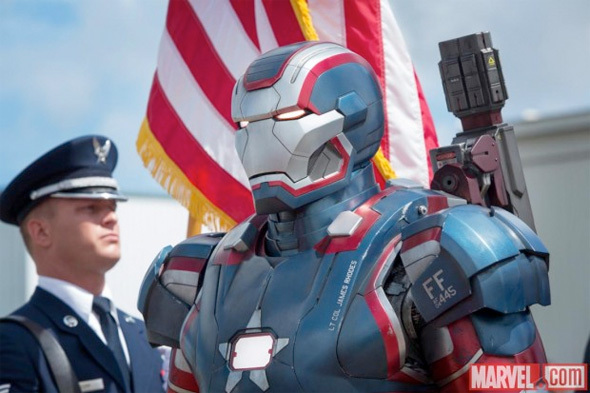 . .
Just noticed Iron Patriots armor has LT COL James Rhodes written on the chest plate. All this bitchin' about the broken mask (which actually could be a homage', by the way), when Rebecca Hall is there. The first time I saw her I thought "Well, she's attractive"...pretty soon I was "Damn, that's a cool chick, fine woman,great actress!!"